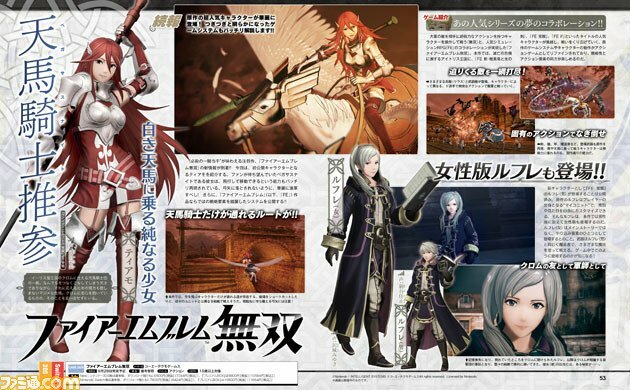 This week's Weekly Famitsu magazine is going to have a brand-new information batch for Koei Tecmo and Intelligent Systems' upcoming collaboration game Fire Emblem Warriors. Two more new characters are confirmed getting added to the roster so far, which are Cordelia and Female Robin from Fire Emblem Awakening. This batch will also explain more on the gameplay systems such as Weapon Triangle, Effective Damages, and routes accessible only to flying classes, as well as confirming a Permadeath feature where fallen characters will not be available in further battles. UPDATE: We have obtained the magazine and made a detailed translation of the gameplay details which can be read below. One of the Pegasus Knights who serves Chrom of the Halidom of Ylisse. Although she is a genius that can do anything flawlessly, she also has a serious personality and does not reduce her efforts to live up to expectations. Despite having a crush on Chrom, she cannot say it out to him. The female version of Robin will also appear in this game in addition to the male counterpart. However, Female Robin will not be featured in the main story (as Male Robin already takes her place there), so she will only appear in the bonus modes (such as Coliseum mode which was revealed at E3). She will also have the same magic book weapon as her male counterpart. Just like the mainline Fire Emblem games, Fire Emblem Warriors will also have a Permadeath feature where fallen characters will not be revived in future battles. However, no characters will actually die in this game, and instead, they will be given a permanent injury that will make them unable to participate in future battles while still being alive and taking part in story conversations. As with recent Fire Emblem games, there will be an option to choose between Classic and Casual modes. In the latter mode, fallen characters can still be selected for future battles. 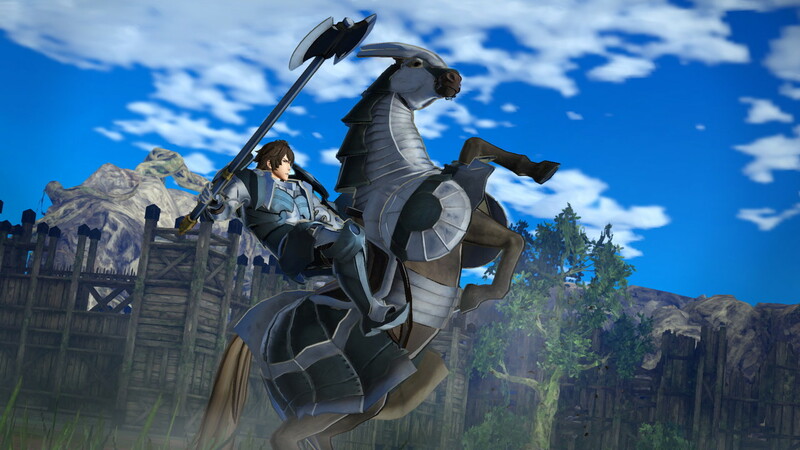 Some maps in Fire Emblem Warriors will have routes that can only be accessed by flying classes such as Pegasus Knights, giving them more mobility around those maps. However, since fliers are weak to archers, the player will also need to pay attention to enemy archers that may be waiting at the other end of the route. Other than the common example of Archers dealing more damage against Pegasus Knights, weapons that deal more damage against certain classes will also appear in this game. An example is the Armorkiller sword which is effective against armored classes like Knights. Characters will be able to collect and equip multiple weapons of the same weapon type available for their class. The weapon triangle in this game will only use Sword, Spear, and Axe. The player can check which enemy officers the party characters have advantage or disadvantage on by looking for upwards and downwards arrow marks in the map menu. If the character has an advantage to the enemy, a yellow Stun gauge will show up on the enemy (which is similar to Weak Point gauge in Hyrule Warriors). Attack the said enemy to reduce their Stun gauge, and when depleted, the character will unleash a powerful finisher attack (which is similar to Storm Rush in Dynasty Warriors 8). You can give orders to other characters in the map menu. They can be sent to various points on the map, and you can even give more detailed orders such as attacking a certain enemy officer or base, or defending ally officers and bases. You can also set their automatic tendencies when not given orders, such as to focus on attacking or defending, and also whether to allow them to automatically use their healing items or not. As we have seen in gameplay footages from demos at E3 and other recent game shows, you are able to instantly switch to another character in the battlefield anytime. The previous character will get to move on their own in according to the tendencies you have set for them if you haven't given them orders yet. It is confirmed that you can have up to 4 playable characters in your army for a battle. 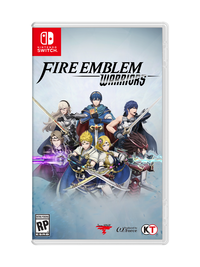 Fire Emblem Warriors will be released for Nintendo Switch and New Nintendo 3DS in Japan on September 28 and in the West later this Fall. The previous information batch introduced the key characters from Fire Emblem Awakening and Fates, which you can read right here.